Intertops Casino Review 2019 - 100% Bonus up to $100! Continues to accept real money bets from the U.S.
Visit Intertops Get Your Welcome Bonus! Intertops is regulated by the Kahnawake Gaming Commission. Software providers are certified for offering fair games. Good variety of payment methods for American and international users. ? All legitimate, real-money online casinos like Intertops Casino have strict anti-fraud screens, and that may create a short withdrawal delay. Withdrawals approved in two business days. Register a new account and you will unlock a 100% match bonus of up to $100 on the first deposit. Use the Intertops bonus code SIGNUP100 in the cashier and enjoy the extra funds! ? Please read the terms and conditions carefully and make sure to take full advantage of the bonus offer. 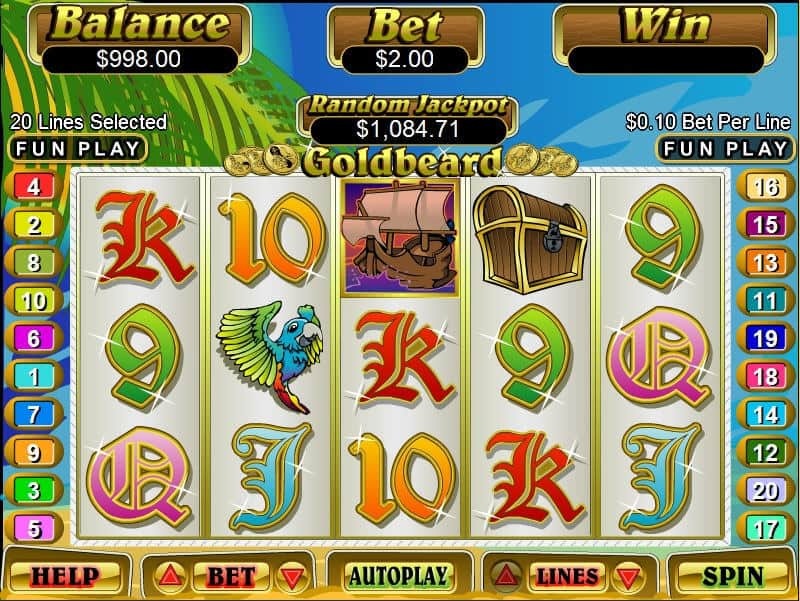 The search for the best real money casino games online is definitely one that requires a lot of time and resources. There are hundreds, maybe even thousands, of online casinos that can satisfy a need for gambling. However, they are definitely not all equal and some casinos are far better than others. Being able to spot the differences from the start requires a lot of experience and skill so beginners can often make mistakes when joining new gaming sites. Our mission here at CardsChat.com is to provide you with the needed resources so that you can make the best decisions from the start and join the ideal casino. This brings us to Intertops Casino, one of the first gaming sites to take real money bets. It was launched in 1996 so it&apos;s one of the oldest internet casinos you will find still running today. Don&apos;t let its age fool you, Intertops Online Casino uses modern software from two of the largest developers to provide a rich collection for players from the United States, Canada, Europe and many more. The operator is licensed and regulated by the Kahnawake Gaming Commission and the online security can even exceed the systems used by your local banks. Intertops comes with two online casinos that each have a different style. 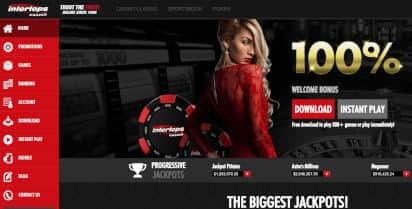 Intertops Red Casino and Intertops Classic Casino are covered in our expert review since they can both be enjoyed from the same account. In addition, the site also hosts a complete online sportsbook and a real cash online poker room. The same cashier is shared by all products on the network in order to provide safe and secure banking for customers within the USA and beyond. It is not uncommon nowadays to see an online casino with more than one software developer. Intertops however does things in its own way by keeping its two main providers somewhat separate. The main casino is powered by Real Time Gaming with a full portfolio of gaming options. Then, the Classic Intertops online casino uses software from WGS Technology for a slightly different style and a whole new selection of games. The result is more variety while still keeping the high level of quality. Each of the two software providers comes with its own lobby that you can access on the site after signing in. The layout is similar so the games are nicely organized for easy access. User-friendly controls make sure that beginners and experienced players alike can enjoy the gaming options to the fullest. The software is compatible with mobile devices instantly while desktop players can opt to download the dedicated client to have faster access when they want to start new sessions. Download Intertops Casino software on your computer. You can find the download button at the bottom of the page and it doesn&apos;t take long to get the app and have it installed on a Windows PC. After that, you can easily sign in and play all of the games that Intertops has to offer. Sign in on the site and play instantly. The no download version of the online casino runs really well, although it doesn&apos;t have all of the games available. Continue playing from your mobile device. Just because you are leaving the house, it doesn&apos;t mean that you have to say goodbye to your favorite games. The Intertops Casino mobile site works on just about any smartphone and you can connect with the same account. Although nobody back in 1996 could have even predicted the current size of the mobile gaming industry, Intertops has definitely kept with the times. This includes an offering with a mobile-friendly website where players can bet real money on slots, table games, video poker, and various other options from their smartphones. When you are browsing the main collection from a computer, you will notice that some of the images have a smartphone logo in the bottom right corner. This is there to let users know that the game in question has been optimized to run on mobile devices. Not all 300 of the games are available for mobile betters but the selection remains very good across the two casino sections. There are over 100 Intertops mobile casino games and the majority is represented by slots. Even some of the big progressives can be played on the move if you want to try your luck at winning substantial jackpots. The one thing that could have made the Intertops Casino mobile platform better is a downloadable app for iOS and for Android. The operator is not currently available on iTunes or on the Google Play Store so mobile users can only connect from the site. Intertops promises its players 300+ casino games and it delivers on this promise. In order to get the complete collection from RTG, you will have to download the software since not all of the games from the studio are available in instant play. However, the selection is still very good on the site, with around 150 games in the lobby. Then there is Classic Intertops Casino that has about the same number of games on the site. The elegant lobby allows users to easily locate the options they like and start playing within seconds. Both collections are split across slots, table games, video poker, specialty games, and progressives. It is definitely nice to combine the sections into one full online casino and not limit your options to just one of them. The result is a well-deserved 8/10 for games in the online review for Intertops Casino. When looking at the most-played games on the online casino, most of the featured options are of course slots. 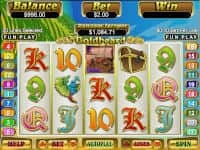 There are plenty of reasons for this, such as the variety of themes, the simple gameplay, the thrilling features, and the potential for big wins on every spin. Intertops Casino offers all of this and more with its hundreds of online slots games. Covering categories for 5-reel, 3-reel, 6-reel and progressives, there are slots for all types of players. 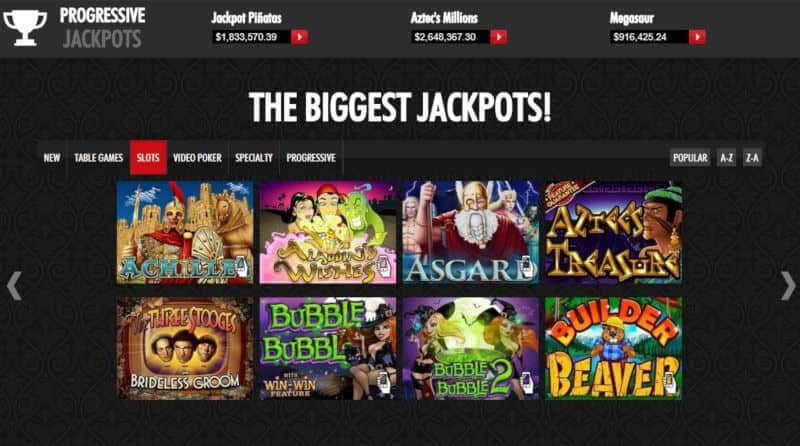 Some of the progressives really stand out in this category and the biggest jackpots are presented on the main page. Prizes that go over $1 million are common. For example, the Aztec&apos;s Millions progressive jackpot is known to go over $2.5 million. In order to win the full amount, you need to get five symbols with the game logo on an active line, for which bets are of $0.20. You can play it and other games at Intertops Online Casino right now. Games can be started from the main lobby and they will quickly load in the same window. Demo mode allows users to practice most of the games for free. The switch to real money play only takes one click if you have funds in the account and are ready to go. The second most popular category of casino games is for tables. The selection found during the Intertops Casino review was decent to say the least. There are more than 25 no download gaming options across the two casinos. These cover blackjack, baccarat, Caribbean hold&apos;em poker, pai gow poker, tri card poker, craps, red dog, and roulette. One thing we noticed is that the main Intertops Casino lobby lists American roulette, craps, and European roulette under specialty games and not in the category for table games. If you are having difficulty finding your favorites, just use the search function for faster access. The selection of video poker is very impressive at Intertops Online Casino. There are tens of titles in total and they cover different versions while also presenting options that show up to 52 hands per round. It doesn&apos;t matter if you like to play 1, 3, 10 or 52 video poker hands as you are sure to find the perfect fit here. With the right moves, video poker machines are usually the best paying games in a casino thanks to the low house edge. An important thing to mention in the Intertops review is that the gaming site is not exclusively available for residents of the USA and Canada. It is available globally and this can be seen when signing up as there are a dozen currencies to choose from. These include USD, EUR, CAD, GBP, SEK, ZAR and AUD. The list of accepted deposit options also does a great job of catering to all playres by including cards, web wallets and digital currencies, even if not all of them are available for every customer. The processing period of two business days is a bit longer than we would have liked it to be. Intertops has a good record of paying its customer but like it is the case with all online casinos, you will have to submit some documentation to prove your identity before you can cash out. Once you have money in your Intertops wallet, you can transfer chips between the different products. The account displays separate balances for Casino Red and Casino Classic. Bonuses for new players are as old as the casinos themselves. It is a tradition that continues to this day and it is a factor to consider when joining. In this case, the Intertops bonus is of 100% of the first deposit, going up to $100. This may not seem like the biggest offer in the world but it is the perfect amount for most players. As a result, the majority of new customers can double their bankrolls and have twice as many chances at hitting those rare combinations that pay big. It&apos;s worth noting that bonuses are meant for playing and so the funds have to be rolled over quite a few times before cash can be withdrawn. As you can see from the Intertops Casino review, the rating for the bonus is not that high. This is due to the high wagering requirement that forces players to bet a lot of money before the funds are unlocked and available for withdrawals. On a first deposit of $50, you will need to bet $3,000 on slots, which is quite a bit. Also, table games and video poker don&apos;t contribute at all. We strongly recommend that you always read the bonus terms and conditions very carefully first. For players who plan on betting frequently, the requirements can be met without much hassle. It requires a high volume of play. Take part in the massive giveaway and get shares of the weekly prize pool of $30,000. You need to deposit $75 or more to get on the weekly leaderboard. Improve your ranking by getting 1 point for every $100 you bet on any game. The 300 highest ranking players get prizes every Thursday, while one of the top 20 users wins $1,000 in cash. Intertops casino is giving away prizes worth $1,000 every day. All you have to do is play the games for real money and you will be entered automatically in the daily draw. Spin the wheel to see if you are one of the 20 lucky ones that get $50 each. Mobile players are rewarded with special bonuses. Bet at least $500 on Intertops Casino mobile games. Check the email to see if you are one of the 20 weekly winners. For every bet on the online casino you will get comp points. $10 in wagers generates 1 point. You can see the current balance in the account at any time. Comp points can be turned into cash money at a rate of 100 CP for $1. Promotional packages for active players can offer large amounts for free. For example, the Cinco the Mayo promo offers up to $1,000 and 100 free spins across three deposits, plus an extra no deposit freebie of $33. Join Intertops Casino and get started with 100% free, up to $100!